That's pretty much Australia, right? 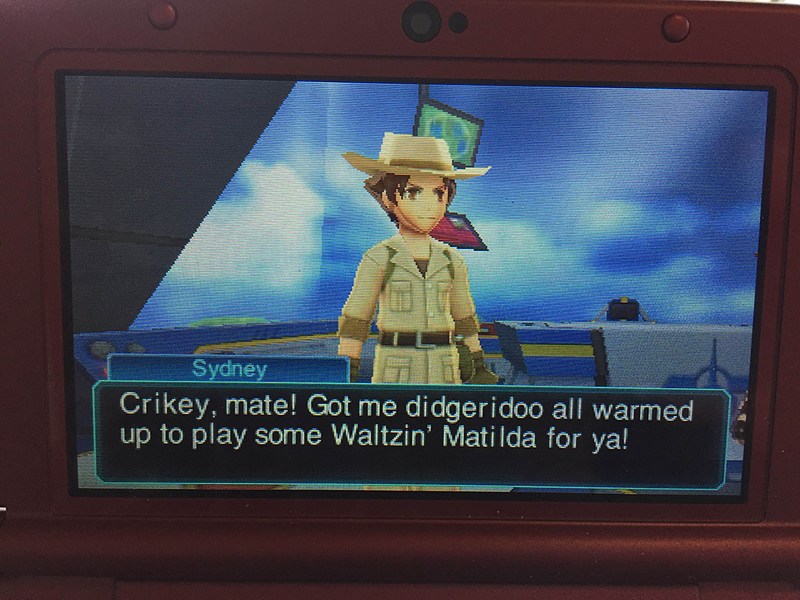 Sure, it's a little light on what we Americans know to be traditional Aussie flavor, but having been to Outback Steakhouse where I partook of a Bloomin' Onion and seen all of Crocodile Dundee one and bits of two, I'd say Red Entertainment and Spike Chunsoft nailed it. I guess it's because both of the developers of the dinosaurs-meet-Pokemon game are located in Japan, which is much closer to Australia than it is to Paraguay. Had they tried to make a Paraguayan character they might have had to resort to typical Paraguayan stereotypes—most of them live in Paraguay, they eat food native to their region, their president is Horacio Manuel Cartes Jara. Instead they went with what they know, and it's a better game for it. While I'm still early on in the game, I'm looking forward to spending more time with Sydney (though that's an odd name for an Australian). As long as he passes his Warden exam, he and I are going to be the best Paleo Pals ever.